1. Preheat the oven to 220°C, gas mark 7. 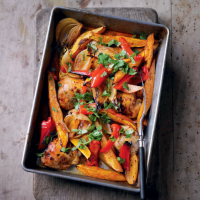 Place the chicken, onion, pepper and sweet potato in a large roasting tin. Mix together the lime zest and juice, chipotle paste, honey and oil, and toss with the chicken and vegetables. 2. Bake for 30 minutes until the chicken is cooked throughout and there is no pink meat. Stir in the coriander and serve.